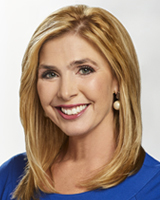 Karen Rogers is the weekday traffic and weather anchor for Action News Mornings. Karen is a meteorologist who earned her seal of approval from the American Meteorological Society. She holds a certificate in Broadcast Meteorology from Mississippi State University following three years of studies in atmospheric sciences and geosciences. Karen talks about her road to Action News, the newscast she watched growing up in New Jersey. Karen also holds degrees in Communication and Sociology from Rutgers University in New Brunswick, where she was valedictorian of her communication class and the class speaker for commencement. Karen is listed in "Who's Who Among American Colleges and Universities". After graduating with honors, Karen traveled to the United Kingdom as a Rotary International Scholar where she pursued her graduate studies in Broadcast Journalism. After graduation, Karen briefly worked at WHSP-TV in Vineland, NJ where she anchored daily news cut-ins, interviewed political leaders for her monthly show, Congressional Report, and hosted weekly talk shows. Why Karen is so passionate about sharing the news and important stories at Action News. Karen was born and raised in New Jersey along with her nine brothers and sisters. She says she grew up watching Action News and never imagined she would one day be a member of the Action News Team. She joined the station in 1996 as a reporter and producer for the show AM/Philadelphia. Karen quickly joined the AccuWeather team and found her true passion in weather forecasting. Along with her role in news, Karen co-hosts FYI Philly, a weekly fun-filled entertainment show that airs on Saturday nights at 7pm on 6abc. Karen enthusiastically became involved with a number of 6abc special projects over the years, including co-hosting Philly on Wheels, The Philadelphia Home Show, and the Miss America Preview Special. Karen also reports for the 6abc Thanksgiving Day Parade, 4th of July Parade and the Philadelphia Flower Show. In addition to her work at 6abc, Karen is active in supporting young people. She says one of her most rewarding experiences was working with the Child Assault Prevention Program teaching elementary school students empowerment skills for reporting and preventing abuse. Karen answers some very important questions. Karen says she drives to work every morning feeling blessed to work. The Phillies host the rival Braves for a three-game set, the Plash downtown route resumes and more to do this weekend. Deadly accident on Route 55 in Elk Twp., N.J.
One person is dead following a crash on Route 55 approaching Exit 48 in Elk Township, New Jersey early Thursday. 6abc's Karen Rogers offers a touching tribute to her mom for International Women's Day. Inside the unique space of the historic Roebling Wire Works building in Trenton, young lives are changing one act at a time. All summer long, the Camden County Animal Shelter in New Jersey is holding special events to promote animal fostering and adoption.